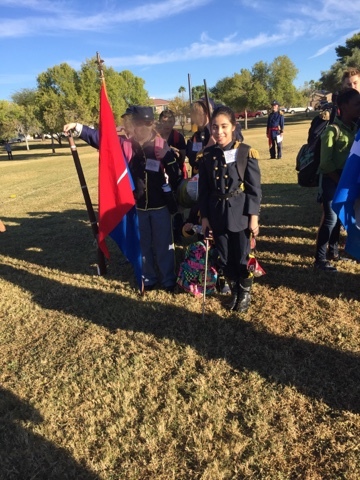 After months of preparation, 7th students at Desert Shadows Middle School participated in an epic reenactment of the Battle of Gettysburg on November 12, 2015. 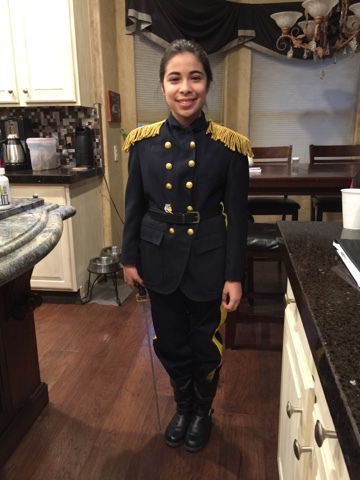 My daughter, T, was to play the Union captain, George Custer. And I volunteered to grade a group of soldiers so I got to tag along the entire day. As a captain, T was required to have a sword and she had a strict guideline to make it out of wood and not purchase one already made. 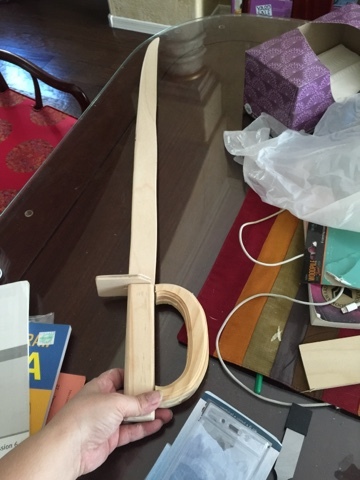 After watching a few YouTube videos on handmade sword, I purchased a coping saw and a flush cut saw and started work. 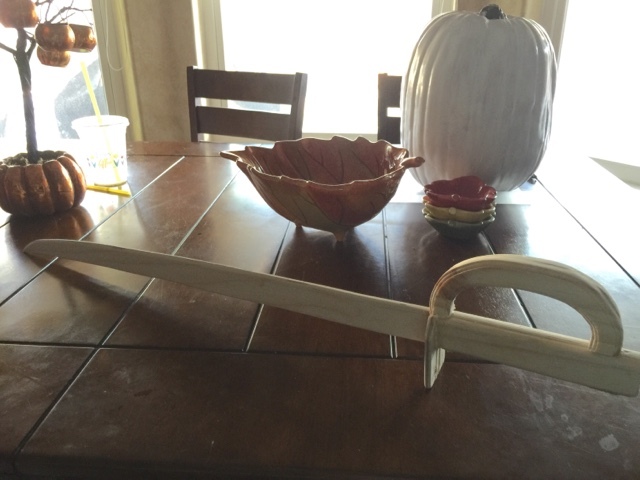 got to work, cutting, sanding, and gluing. 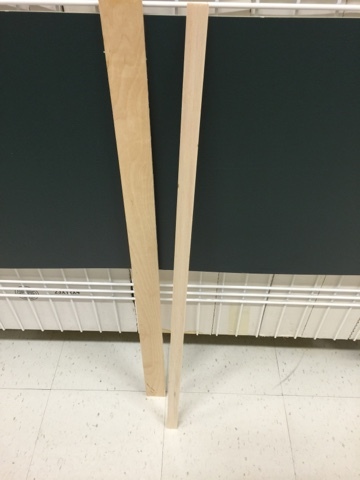 I put the rounded handle on the wrong side so I had to pry the joints. 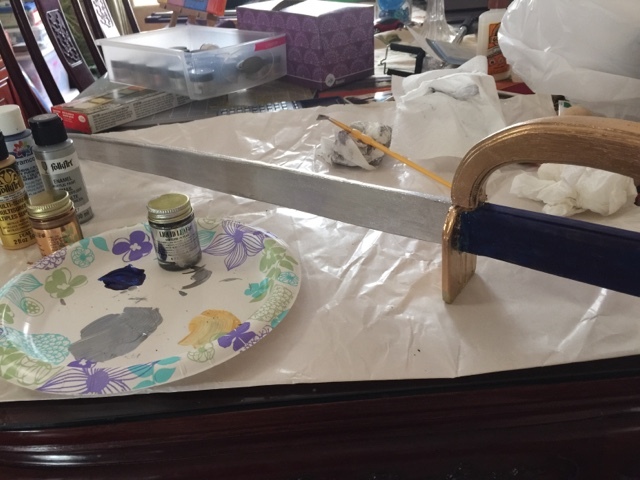 Once T and I painted the sword, it looked like this. The uniform was much easier. I went to a local thrift store and purchased a navy suit jacket, blue pants, and boots. I added gold buttons and snaps to the jacket and created the epaulet (the fringed shoulder thingy) with felt, cardboard and gold fringe. On the pants, I sewed yellow ribbon along the side. I added a loop on the belt to act as a sword holder and the outfit was complete. 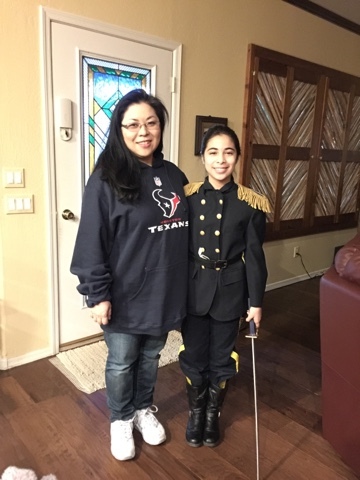 Students worked with teachers and reenactors to learn commands, drills, and battle strategies. 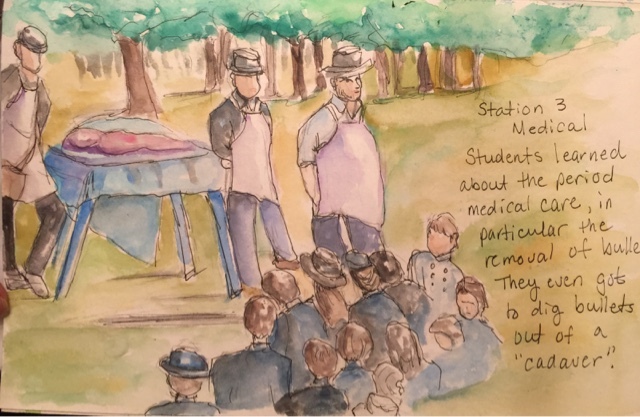 In the classroom, they learned the typical facts about the Civil War. As a grader tagging along with a Union troop, I had to wear something navy so I wore my husband's sweatshirt. 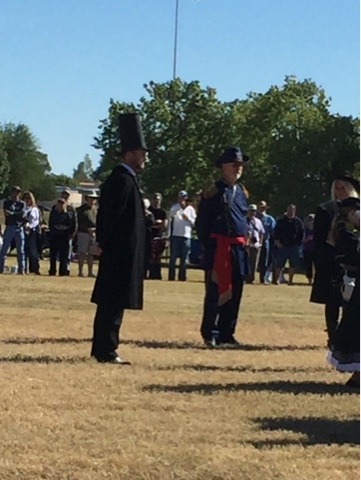 The reenactment took place in a park next to the school. 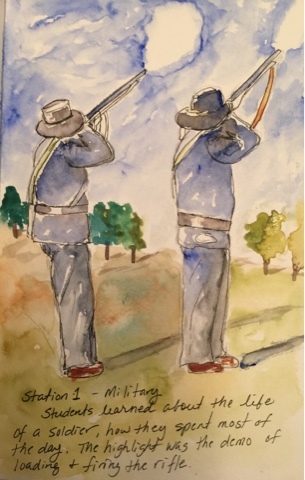 There were 25 union troops and 17 confederate troops and when they all lined up, it was an impressive scene (can't post pictures). Here is my daughter's troop. Each troop had a flag bearer and 8-10 soldiers. The day consisted of setting camp, 4 learning stations to cycle through and re-enacting 3 days of battles. 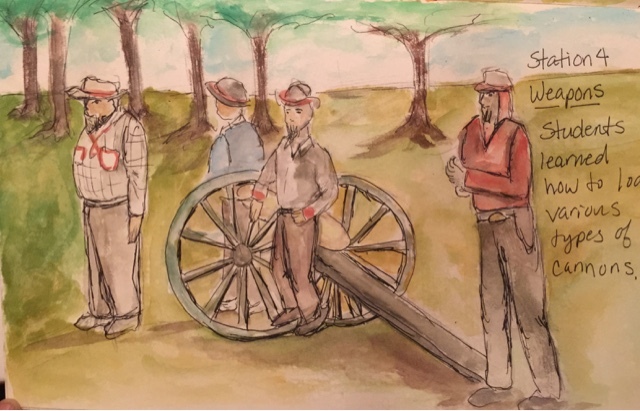 Before each battle, the troops lined up and heard speeches given by generals and even by President Lincoln. Each student was given a fate card for each battle and they were to act that out and after each battle, Taps was played to honor the fallen. 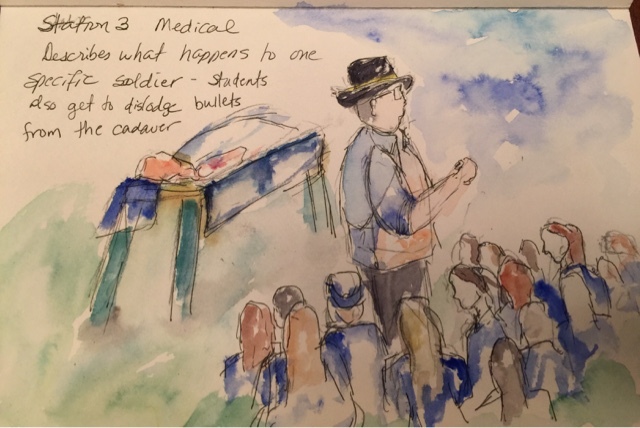 And each successive day, students saw the number of wounded and killed grow. It provided a visual account of lives lost. This is the scene after the third day of battle and for students and spectators, it was a chilling scene. 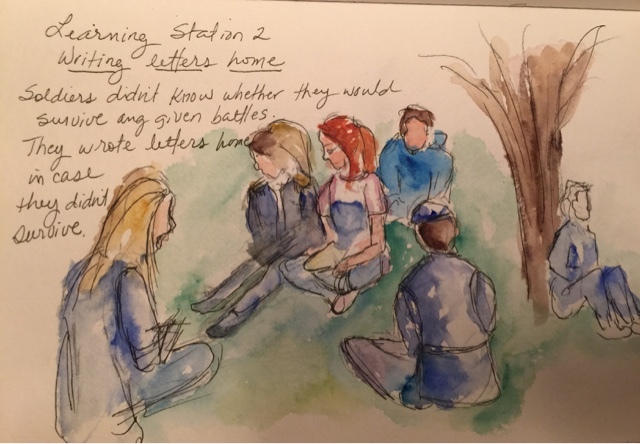 I was there as a grader so I didn't have much time to draw except when they were at each of the four learning stations. I did two sets of painting for each learning station except for one, one "live" and one after the fact from a picture taken. 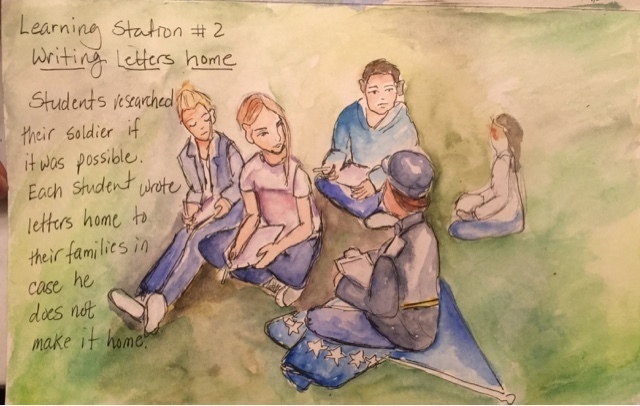 At the first learning station, I was not confident enough to draw "live" so I took a photo first and drew it while students listened to the lesson. With each set, the first is the "live" version and the second is from a photograph taken. There are things about both versions that I like. In the live version, I think you can feel the energy of what was happening better. And in the second, you see more details. 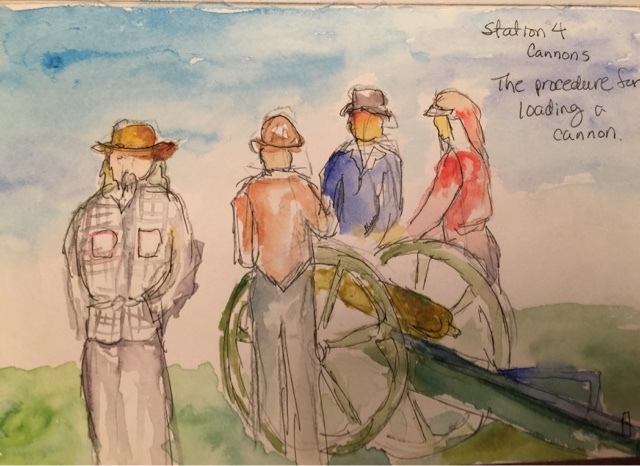 And this was my very first attempt at plein air painting, not only was I painting "live", but I also had time constraint (less than 10 minutes) and I was painting people who were constantly moving. But I would like to try more urban sketching. Finally, here is a link to a news story about the day and you'll see my daughter at the very end. It certainly was a learning experience for the kids as well as for adults! Man, Angelcake, you sure have a lot of energy to go along with all of that talent! Thanks for sharing all of this (and making me even more jealous of creative people). You are also a good mom. Funny, in these pictures, with her hair back away from her face like that, your daughter looks a little bit like Sarah Silverman. Gorgeous. You already know how I feel about your art so I won't bore you with effusive compliments! Have a very good weekend, Ms Kari.